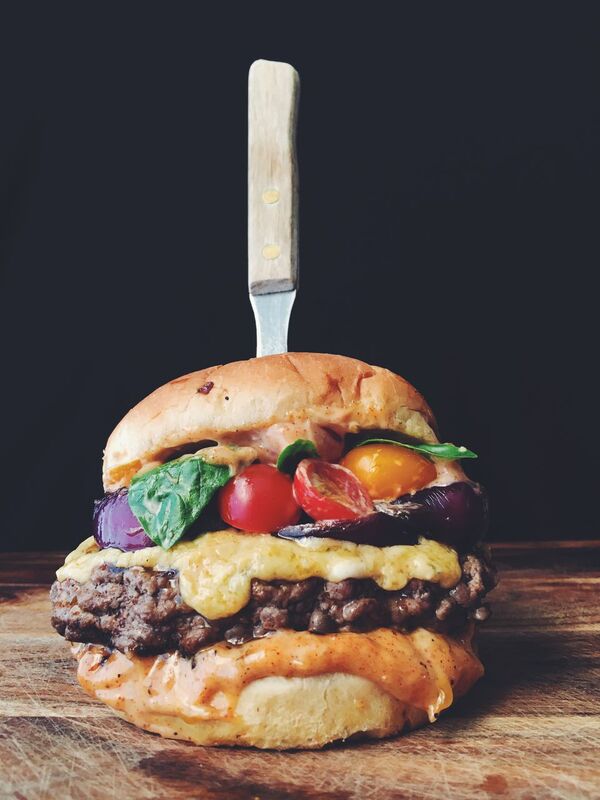 A rich and tangy blue cheese beer sauce, grilled red onion, heirloom tomatoes, fresh basil and a sweet n spicy mayo on CBC's onion kaiser rolls may look like something that you'd order in a restaurant, but nope! You can enjoy this right in the comfort of your own home. In a small saucepan, make a roux with the butter and flour, cook down until flour is cooked out and then add in the beer and whisk. Once it thickens, add in the blue cheese, the cheddar, and stir. If too strong, add a little honey. Season to taste. Form a patty with the meat and sprinkle with salt on all sides. Grill the burger over high heat until you reach your desired doneness. If you don't have a grill, you can totally do this in a cast iron skillet with some butter. When it's done, set the burger aside. Meanwhile, toast your buns and smear some mayo onto each half. Add the cooked burger, then the blue cheese beer sauce, the red onion, the tomatoes, the basil, and then the other half of the mayo'd bun. Serve immediately. 5 Detroit Sandwiches That You Need to Try Right Now!